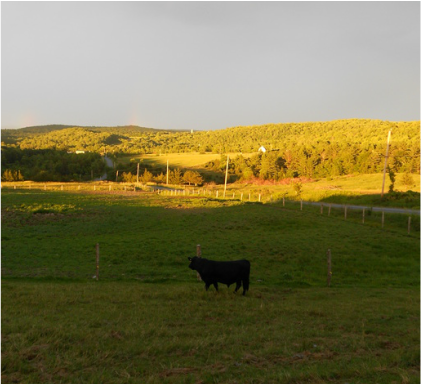 We are a grass fed, black angus beef farm located in West Haven, VT. Unlike many farms, every Charron Farm beef is born and raised on our property. When you buy from us, you can take comfort in knowing exactly where your meat comes from. We take great care and pride in our animals. David has worked for many years on perfecting the herd, and they look great! Our History: Charron Farm was established in 1959 as a family dairy farm by Charles and Bernice Charron. Charles and Bernice had 13 children. David grew up milking cows and has continued to run the farm which switched from Dairy to Black Angus beef in 2004. In addition to selling all natural grass fed beef, the farm also sells all natural baled hay. Charron Farm is committed to Vermont sustainable agriculture. ​David's lifetime of experience in farming is evident by the condition of his herd. These beautiful animals are born and raised on the farm. We have been selling our beef to wholesalers who in turn have sold to their customers. This year we are ready to sell directly to customers, and are sure you will enjoy being able to buy your beef directly from the farm.